It took councillors less than half an hour this morning to throw out plans for a £12million investment in new shops and business units for Haverhill, which would have brought 260 jobs. The former Project site scheme, called Hamlet Green, from Cambridge firm HPG Developments, would have brought the Ehringshausen Way site back into use as 11 business units, nine warehouses, four shops, a builders' merchants and a drive-thru restaurant. Wickes had already agreed to come to the builders' merchants site and it emerged at this morning's meeting the drive-thru restaurant would have been a MacDonalds. But St Edmundsbury Borough Council development control committee, meeting in Haverhill after visiting the site, agreed to refuse the application by a majority of eight to one, fundamentally because of fears it might damage the town centre. Nearly half the committee of 16 failed to turn up to the meeting. The three Haverhill councillors on the committee all voted to refuse the plan, although two other Haverhill councillors, Gordon Cox and Les Ager, had sent letters supporting the scheme. The plans were outlined by council planning officer Gemma Pannell, including an assesment report which estimated the proposed development would draw ten per cent of its turnover from the town centre - about £1million a year. Members of the public who had registered to speak at the meeting were then allowed three minutes each. Only three had done so, one of them the agent for the developer. The other two were Mark Chapman, of Chapman and Son in Haverhill High Street, and Haverhill Town Councillor Alison Snape. Mr Chapman said the town centre was very fragile at the moment and business was not good. "Anything that erodes footfall from the town centre is bad news," he said. "I believe the next retail development in Haverhill should be on the Gurteen site in the town centre and not further out of town. "High streets are being boarded up up and down the country and this is due to out-of-town shops. We pay very high rates in Haverhill town centre and we deserve some protection." Mrs Snape said the town council objected to the scheme because it took the view that it would significantly contribute to under-trading in the town centre. "I understand the need for employment but we should encourage other retail sites to be used and the Project site should be kept for employment," she said. "As a councillor for the east ward I am concerned especially about the drive-thru restaurant, which will cause higher levels of traffic noise, which can be heard further up the estate." Robert Shrimpling, agent for the developers, said the plan represented a £12million investment in Haverhill at a time when public and private investment was very scarce. Investment had provided real and dramatic change in Haverhill recently and this scheme would ensure it was maintained, he said. "This is a visible sign of confidence on a gateway site in the town," he said. "It will provide 260 new jobs, the employment units will provide an economic boost, a quarter of a million pounds will be made available for improvements to the town centre and the wildlife site at the rear of the site will be enlarged." He claimed it had backing from several councillors and MP Matthew Hancock, and it would help stimulate the town centre, not damage it. With regard to the Gurteen site, he said Wickes had already indicated this would not be suitable for them. "Nevertheless, it is true there is a delicate balance to be struck between the positive and negative aspects of the scheme," he said. Councillors did not engage in any lengthy debate, with Cllr Robert Clifton-Brown of Little Bradley the only member in favour of the plan. "The site is already there," he said. "It is an expensive site to develop and there are 260 jobs at stake. I would support it." But Haverhill councillor Anne Gower, who had asked for the committee to meet in Haverhill and had hoped more people might attend, said she did not believe the scheme would encourage more people to shop locally. 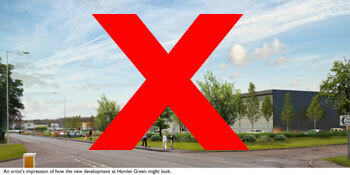 "I agree the site needs developing because it is a bit of a blot on the landscape at present," she said. "I support the business start-up units. But I have sympathy with Mr Chapman that we have to protect the town centre retailers to keep it viable. "I have an issue with the drive-thru restaurant, which is MacDonalds, I believe, in that we have anti-social behaviour problems at the sites of the two drive-thru restaurants in the town, and residents whose lives are badly affected by it." Members were worried the developers might not get takers for the shops and then might come back with applications to use more of them as restaurants, but were told by council planning director Patsy Dell they had to consider the application in front of them and not their fears for the future. Anglian Water objected to the scheme because it was within 400m of their sewage treatment works, part of a new policy the company had developed with regard to planning applications, due to fears that development might lead to odour issues. Ms Dell said the council's own environmental health officers did not agree, but the planning department had to back Anglian Water as a statutory authority, on the understanding they would provide resources for any appeal, if the plan was approved. Haverhill councillor Tim Marks pointed out there were many homes well within the 400m limit, one of which had only just been built, and he found Anglian Water's objection 'disingenuous at least'. The grounds for the committee's refusal were that the site was not not allocated for retail in the local plan, so would be contrary to council policy, and that the assumptions about impact on the town centre were not justified. A secondary ground was in support of Anglian Water's objection. Planners also considered the allotment site in Duddery Hill should have been considered first as it is closer to the town centre. Members were told this site, which includes the Wisdom Toothbrushes buildings, had been allocated for bulky goods retail in a previous local plan but was deleted by a planning inspector. Planners now felt it was appropriate this site should be included as part of any plans for Haverhill's retail development, particularly as it was now more likely to become available, due to recent changes at Wisdom. Ridiculous decision. When will Haverhill get decent retail facilities? Retail parks are not usually close to town centres as they serve a very different purpose than general town shopping. 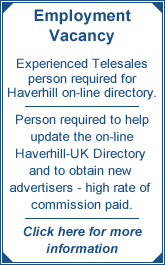 How will we attract people into Haverhill at all if they can't buy what they need? I'd rather go to Cambridge for bulky goods and diy, if only the general people and families of Haverhill had been considered rather than a few shopkeepers scared of the competition. Also how in the current climate can the Council turn down the oppurtunity to create 260 jobs when so many people are losing them? Not to mention the 250k for the town centre? I can't see why this would be turned down. Let's get the economy going in Haverhill so people actually have money to spend in the town centre. I just hope the council put this right and get the allotment site available soon and get developers interested. But it seems unlikely as only half the councillors bothered to show up at all. Meanwhile they are celebrating the opening of the Apex in the stunning retail development in Bury. Haverhill is destined to be poor little sister. I am sick and tired of our councillors. So it's ok to stick a supermarket right outside the high street when there's already one, but a retail park that is not even on the door step of the town centre, no that's not acceptable. I guess our councillors are more easily swayed by money from large supermarkets. You know, those supermarkets, well known for protecting the little shops. I can't believe that this has happened. Or rather, unfortunately, I can. I grew up in Haverhill, and we had nothing. You had to go to Cambridge or Bury for everything. Then when someone wanted to convert a unit on the industrial estate to a bowling alley, this got rejected. Even when a cinema was suggested, the best that happened was the Arts Centre showing some films late (often already/close to video release). Shopping never improved at all whilst I was growing up. We desperately needed some of the typical High Street names, but they weren't interested. Eventually, the snooker hall became a bowling alley, but by then I had left. I recently moved back to Haverhill having finally seen the expansion of the town, it finally getting a Cinema and thinking that perhaps Haverhill is finally becoming the town the Master Plan (I studied this as a GCSE humanities project) had wanted it to become. Now it seems that some don't want it to expand any further. We have a Tesco's now. Where were the objections to that, since the town centre didn't need another supermarket (what with Co-op, Aldi and Iceland). I shop in Tesco's, and am happy there is a rival to Sainsbury's, but that is likely to affect Chapman's more than Wickes would. Haverhill has, unfortunately, been the poor sister to Bury, and it would appear that this is continuining now. (You have your cinema, now be sit and play quietly). If you want (and I do want) some of the big High Street brands to come into Haverhill, then there must be somewhere for them to go. The Project site is not far enough out of town to stop people going there and into town. (I regularly walk past the site to go into town, it's not much over 1/2 mile.) I would have siad the 'buy everything in one shop Tescos' is more likely to do that. And where were the other Town Councillors? Are we not paying you to support the town? If not, then please tell us why we are paying you? Haverhill has seen a good expansion in the past 10 years. I came back here partly for that reason. Please tell me that my faith hasn't been misguided, and that the real plan is a move back towards the town of the 80's. Because if that is so, then I feel the NewTown that Haverhill was to become is going to end up a 'Ghost Town' as people who want more variety in shopping, entertainment and importantly employment will move elsewhere. And you won't get them moving back again. Half an hour to throw out the plans, they have obviously given careful consideration to the £12M investment in the town especially as half of their committee couldn't be bothered to turn up. This reeks of an inept committee voting on something the wider Haverhill community should be deciding, had they known about it. The local press should have advertised this meeting as it could have such a significant effect on the town. The wider picture is Haverhill would have a new Retail park with a much needed Wickes store, £250,000 investment in a town centre that looks and feels decrepit and most importantly an opportunity to fill 260 new jobs on a site where a large firm had sadly closed. The land has sat dormant for far too long and needs to be developed now. Our local MP's have let us down with this ridiculous decision they should have pushed their views much harder had they been in favour of the project, don't forget we voted you in to deal with improving this town not sitting back idly watching this travesty unfold. Whilst you can see the point of the Town Centre businesses not wanting an out of town development taking away trade from them, it is a fact that the town centre currently is old and decrepid and doesn't have the shops people want to visit. Blocking this scheme won't bring shoppers flooding back into the town centre, they will just have to drive to places that do have a Wickes etc therefore increasing carbon emissions. At the end of the day the councillors who claim to represent us need to be told they have made a mistake. Find out who your councillor is and let them know your views, if they know you no longer support them and they risk becoming an ex-councillor they may just think again! Here's the place for comments/complaints. Let's show the council we are not happy. Maybe if enough complained they'd be forced to listen?